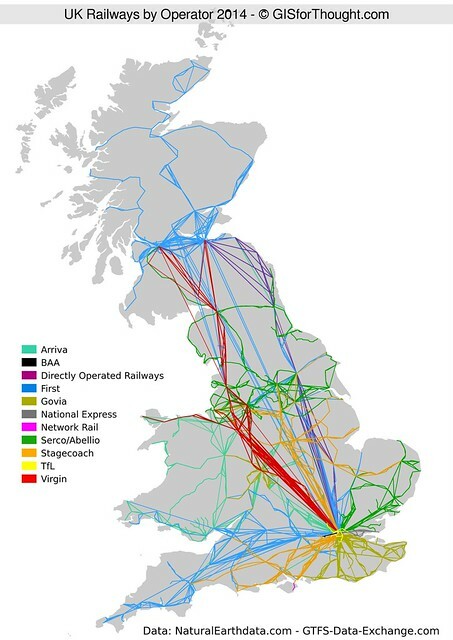 The United Kingdom’s railway network is split up into regional franchises, these franchises are run by private companies who bid on the work. So for example ScotRail, which runs the trains in Scotland is owned by the FIrst Group, who also run a number of other regional franchises. This can however change, when the contracts are up for bid. Interestingly there is also a governmental holding company (Directly Operated Railways), which can take over a franchise if necessary, they currently run East Coast Trains. For this visualization I have grouped Serco-Abellio and Abellio as Serco/Abellio. EDIT: Like mentioned in the Scotland to the Rest of the UK, lines are drawn between stations on a route. So a direct route from Glasgow to London would be a direct line between the two terminus stations. Inspired by Scotland’s connections to the rest of the UK. This entry was posted in All, Maps, QGIS, Scotland on 04/10/2014 by Heikki Vesanto. 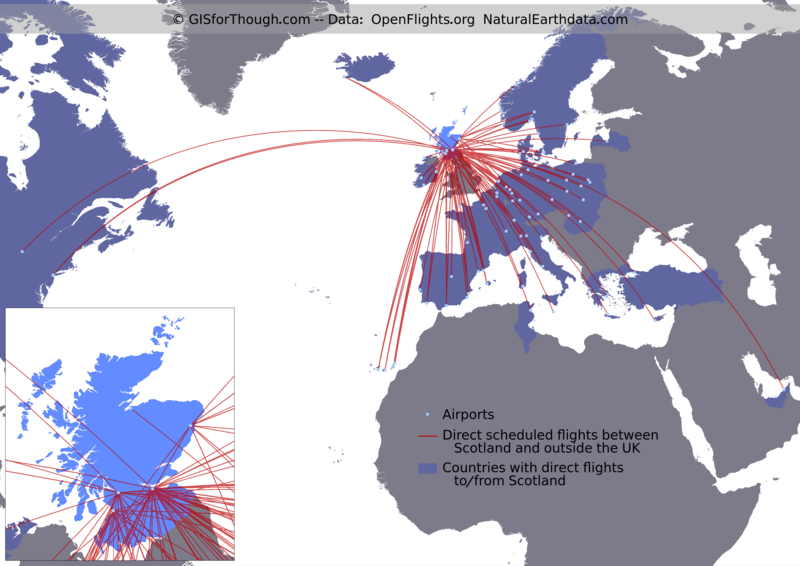 On the verge of the Scottish vote for independence here is a look at all of the scheduled passenger connections between Scotland and outside of the UK. As it is, there are only flights. There are a few ferries between Northern Ireland and Scotland, however NI is still within the UK. No conclusions just an interesting visualisation. This entry was posted in All, PostGIS, QGIS, Scotland on 04/03/2014 by Heikki Vesanto.